Im a Fan of Memphis Center for Aesthetic Medicine... Are you? Fill in the below form and you can recommend ‘Memphis Center for Aesthetic Medicine’ to a friend or family member via a text message. Show your support with a quick share of ‘Memphis Center for Aesthetic Medicine’. Sayyida Abdus-Salaam, MD is the founder/CEO of Memphis Center for Aesthetic Medicine. 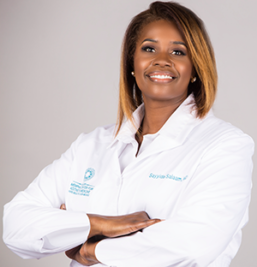 She is committed to bringing her patients an unparalleled level of care with a full range of cosmetic services, and a few medical services. She has chosen her team carefully, to reflect her uncompromising commitment to quality and customer service. I absolutely love this office. From the very professional, courteous, and knowledgeable receptionist. Dr. Salaam explained my procedure thoroughly and what was best for me. She was very concerned about my skin condition and for that I highly recommend her. After Dr. Robert Jackson retired, I had no idea I would find a Certified African American Dermatologist to meet up to his standards of practice. Thank you Dr. Salaam for coming through! Quality Customer Service, Wait Time, Environment, Amazing atmosphere, doctor and staff! Very professional and knowledgeable! I would recommend to everyone, especially people of color. She educates the patient and gives recommendations based on the person. She also educates you on home care and diet. You will not regret this visit. I have been her patient for about three months, and I have never been better in my life. She tells me straightforward and professionally handles my concerns. I love Dr. Salaam and all the other ladies. So knowledgeable and so helpful! Thanks for all your help! The receptionist was professional & courtesy. She greeted me with a smile. Short wait time. Dr Salaam was thorough and took the time to answer all my questions. I left the office knowing that I was in good hands. I love my doctor and the two ladies in the office. So professional and I enjoy visiting with them. Thank you so much for taking care of me!